The official public test network has been officially opened! Now you can test your nodes, either locally or on a VPS, on the public test network. 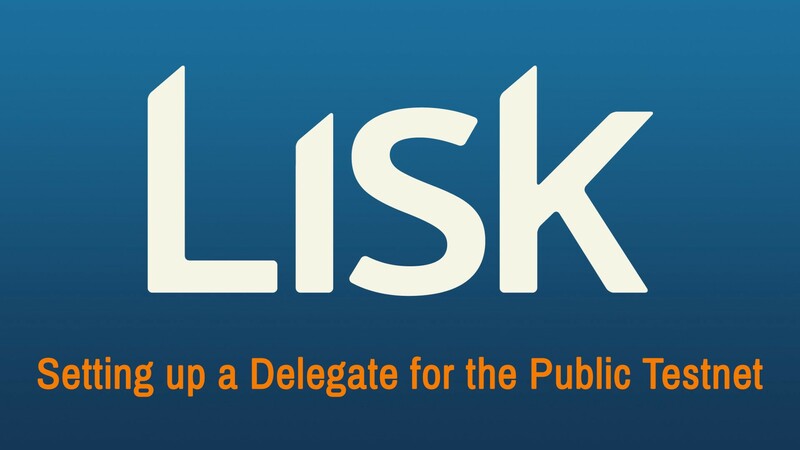 If you’re interested in becoming a Delegate, this is the best way to ensure your Lisk node runs perfectly. Log in to lisk.chat if you are interested, Oliver or myself will vote you into the active delegation. This guide is aimed for people who want to set up a Delegate node during the first week of launch. I will try to keep this guide as straightforward as possible for those who wish to test the delegation, but don’t know where to start or what to do. It will be focused on launching a Delegate on a Virtual Private Server (e.g. DigitalOcean, Vultr, Microsoft Azure, AWS) of Ubuntu 14.04.4 x64. Click here for instructions on creating a VPS, you can follow the first half of the tutorial. PuTTY — PuTTY is an open source SSH and telnet client. Used for remote accessing your VPS. PuTTYgen — An RSA and DSA key generation utility. WinSCP — WinSCP is an open source free SFTP client, FTP client, WebDAV client and SCP client for Windows. Its main function is file transfer between a local and a remote computer. Very handy and a great user interface. To access the Lisk web client, open: http://localhost:7000/, replacing localhost with your public IP address. The Lisk web client should launch successfully. You need to make sure to register as a delegate beforehand or you will not be able to forge a single block. Registering as a Delegate costs 100 LISK at present time. If you are in need of LISK, you can try the faucet, it distributes 1000 LISK per IP address. If the faucet has automatically blocked your IP address, contact me (joel) on lisk.chat and I will personally send you some LISK. 1. Login to your Lisk web client. 2. Create an account (Create a new one for the purpose of testing). 3. Click “Forging” on the Left Header of the client. 4. Click “Delegate Registration” on the top right corner. It will ask for a delegate name (you may choose whatever you like). After registering as a Delegate, you are now ready to begin forging. For you to get voted into the 101 Active Delegates, reply here with your delegate registration name and your current rank. Since this is the public testnet, we are in control of the majority of the funds, and with it, the majority of the votes. Let’s begin forging! This will secure the network and you will receive forging rewards on top of the transaction fees from the Lisk network. 4. Set the secret parameter to your account secret phrase. 5. To set 2 accounts to forge on a single node, enter both account passphrases like below. These commands are optional and enable the user to check, monitor, start and/or stop the node.